Visual Selling provides salespeople with tools to sell in an increasingly image-oriented culture. More so than ever before, the way a salesperson looks and acts, the images on a screen or in handouts, and even room environments can impact people’s trust, satisfaction and willingness to buy. The authors believe that, to sell most effectively, the seller must be the visual focal point. This book draws on 25 years of experience coaching individuals and organizations in the art of visual selling, sharing stories and techniques used in big-dollar competitive presentations and pitches to senior management. 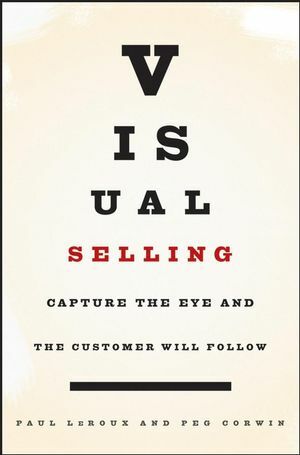 Divided into three sections (the Seller as Focal Point, Getting Ready to Sell and Selling Situations), Visual Selling will appeal to a wide variety of business readers because it can be used to help salespeople sell one-on-one, as well as to assist corporate presenters at selling new programs or products in-house. Paul LeRoux is the founder of Twain Associates and has been coaching salespeople on visual selling for more than twenty-five years. His specialty is rehearsing executives for high-stakes competitive presentations, outside funding pitches, and large audience addresses. Peg Corwin handles sales and marketing for Twain Associates. She has extensive professional experience in sales, having worked with financial services, investment consulting, and real estate firms.